Like our custom boats, the Jarrett Bay 34 Walk-Around Express raises the bar in ride, performance and layout. The semi-production 34 shares many of the custom design elements that Jarrett Bay consistently wins rave reviews for from both owners and the press. Molded from cored-composite fiberglass, we are able to offer the 34 at a price competitive with production boats similar in size. Size, however, is the only similarity to production boats in her class. There are endless options for walk-around boats this size, most powered by outboards, and a fair handful of express boats usually powered by inboard engines. The Jarrett Bay 34 however, combines the best features of each layout, offering 360-degrees of mobility around the cabin without having to negotiate the narrow shallow gutter most walk-around’s serve-up as a side deck. Unlike most express boats, it is powered by outboard motors mounted on a bracket. 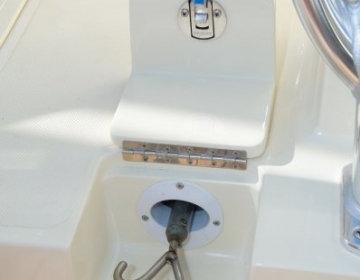 In addition to opening up stowage space inside the boat by having motors outside the boat, outboards also provide numerous other advantages. Modern four-stroke outboards are the quietest marine propulsion available, smoke-free, offer the best horsepower–to-weight ratio, and since they can be trimmed, allow you to adjust the angle of thrust so that it’s parallel with the direction of travel. Inboards waste some thrust due to the down angle of the prop shaft. All of this contributes to a more enjoyable ride, and coupled with our refined hull shape, one that is exceedingly efficient as well. Additionally, since the engines can be completely tilted clear of the water, the boat can access shallow water fishing grounds, take your family to your favorite sandbar, and alleviate worries about corrosion while she’s tied-up at the dock. Of course, we don’t think you’ll be letting your 34 sit in the slip too much. 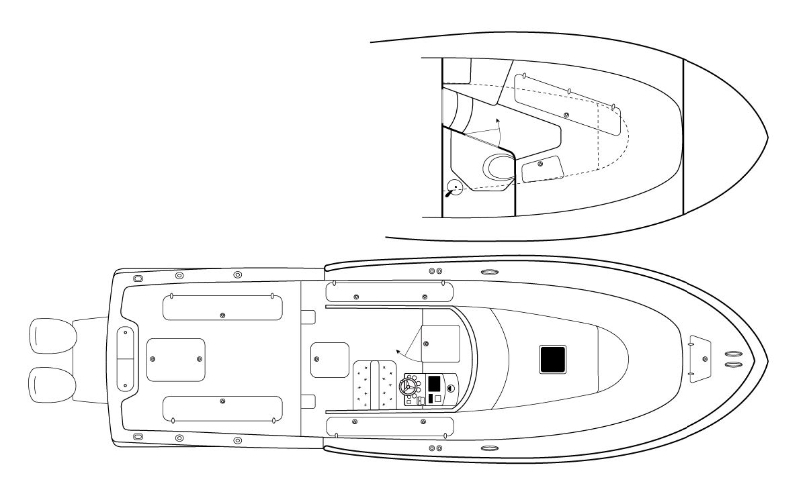 A scaled version of our big boat hulls, the Jarrett Bay 34 features a fine entry, with full sections above the waterline, lots of displacement carried in the convexity amidships, and then tapers to moderate deadrise aft. This symphony of shapes results in your reaching plane easily and rushing to cruising speed with authority. In a seaway, the boat cuts into head seas, but lifts thanks to the fullness in the bow before burying into the face of a wave, giving you one incredibly dry ride. Casual water is deflected by the flare, but with a soft ride and an offshore cruising speed of 28-knots, most spray will be behind you before it can be blown across the boat. At that speed, efficiency nets out at a hair over 1-nmpg. We’d be glad to answer any questions. Perhaps the most desirable characteristics of the 34’s handling are discovered while fishing, either drifting or on the troll. The roll period is easy, providing a steady platform to cast or land a trophy. Backing down on a gamefish, you’ll find the Jarrett Bay 34 nimble and fast. She turns on a dime, the hull seeming to immediately follow your directives from the helm. She is capable of backing faster than anyone can reel to recover line without sending a single wave over the transom. Besides the ride and handling, we’ve equipped the Jarrett Bay 34 with many of the fishing features you’d expect to find aboard one of our larger boats – Dedicated gaff stowage under the bridge deck step, as many as five in-sole fish boxes, and a cockpit wide-open enough to fish four anglers offshore with a major bite on. And since it’s a Jarrett Bay, you can have us build-in many of your custom requests. These might include the décor of the cabin, refrigerated fish boxes, a custom fighting chair…you name it, we can do it. 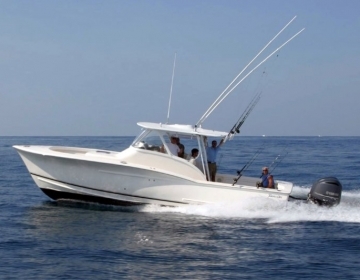 The 34 serves perfectly as a tender to a large yacht, as a day boat to fish solo or with a crew, or as great runabout with rough water ability for family use. 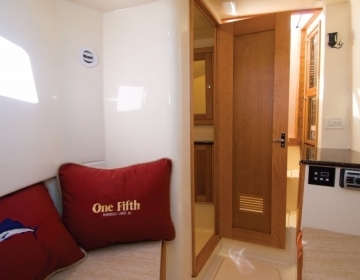 The cabin provides weekend accommodations for a couple and enough amenities to make day-boating with a larger crew far from roughing it. With all of the flare and half the wait of a custom build, the Jarrett Bay 34’ Walk-Around Express marks the ultimate marriage of classic Carolina styling and performance with advanced composite construction processes. Over 20 Jarrett Bay 32s were built between 2004 and 2008. As the first all-fiberglass model designed and built at Jarrett Bay, the 32 line has evolved to become the new 34′ Walk-Around Express. If you are looking at a Jarrett Bay 32′ on the after-market and would like more information, please contact us – we’d be glad to answer any questions.